It happened a long time ago, but I remember it clearly as if it were yesterday. I took my two little children to a birthday party for a neighbor’s child. Michael was just over two, and Noelle about eight months old. Since my husband was working, I was alone at the party. Everyone was in the yard, and Michael went to play in one of those outdoor plastic playhouses. I was right next to the playhouse, and could see his little head and red shirt through the playhouse window. Every few minutes, while holding Noelle, I would turn to see his little head and the red shirt. After about 15 minutes the child turns around I realize I was watching another little boy with a red shirt. I panicked and the entire party began frantically searching all over the yard and in the house for Michael. A mom ran out front and down the street. A few minutes later she returned holding him. Her face was white and she was shaking. “He was standing at the top of the hill in the middle of the street. A car coming up the hill would not have seen him, and he would have been hit.” She is barely able to speak. I grab and hug him, and take both kids home. I wouldn’t call myself a bad mother, ever. It seems that our polite society gets the fact that we shouldn’t engage in political discussions, especially when we have opposing views. But we don’t seem to hesitate for a moment when judging other parents. The anonymity of social media encourages behavior that is quick to judgement, mean and unfair. This is evident in the recent Cincinnati Zoo incident. There is a petition with over 460,000 signatures to hold the parents responsible. Does everyone jump to conclusions? Do we trust the cell phone video coverage over eyewitness accounts? Any parent knows accidents can happen in a single moment. Another example of rush to judgement is the story of the mom who defended the video that shows her baby trying to stay afloat in pool. She taught her daughter to ‘self save’ after losing her two-year-old son in a drowning accident. Could you imagine to have to defend your position of teaching your child a life skill after losing a child? Everyday there are countless situations where parents are told by strangers to ‘watch their kids’ whether it is at the pool or the playground. 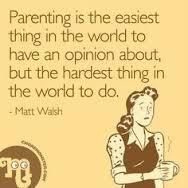 Parenting is a tough enough job without all the outside critics. Honestly, let’s just agree to argue about the election – we certainly have enough to discuss.